From the beginning of human life, humans were afraid of everything that was new to them. Without experience you cannot learn and know new things. Similarly cloud and hosted ERP innovations have been going through different rumors before adoption. 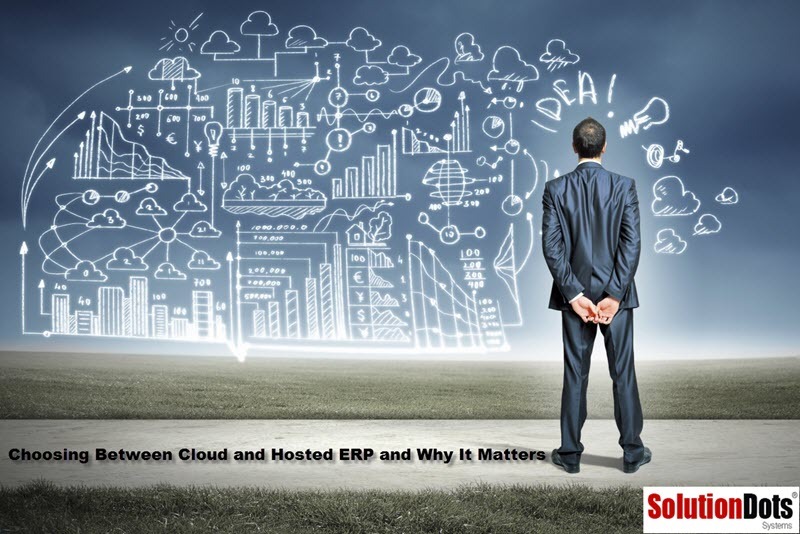 To choose between cloud and hosted ERP and why it matters first we need to understand about ERP. Then we can better understand cloud and hosted ERP. ERP is a short term abbreviation of Enterprise Resource Planning. ERP software was developed by a Garner group in the 1960s. ERP software’s now a days extensively used by many companies to manage their business activities. ERP software basically integrates with company’s business operations and activities like finance, HR (Human Resource), sales, purchase, stock, CRM, production, etc. Cloud ERP small business help companies to plan, track and utilize all business resources to catch their set goals. Main ERP Modules are Purchasing, Inventory Management, Material Planning, Invoice Verification, Material Requirement Planning (MRP), Warehouse Management and Vendor Valuation. Read more about How ERP System Improves Customer Satisfaction? In short, we can say that the cloud based ERP software are blessing for IT field. It gives you the opportunity to manage all business department’s operations at once in an automated way to control workflow. Companies needed to choose carefully cloud and hosted ERP for their business operations. How to Choose Between Cloud and Hosted ERP? Everyone seems to have their own definition of cloud and hosted ERP deployment option for business software. Both cloud and hosted ERP are accessed through the internet and they are very similar. Hosted ERP software is off premise and its access via an internet connection. Cloud and hosted ERP both are really same. Because cloud ERP applications are hosted off premise and accessed through an internet connection. Hosted ERP software applications are off site and typically a business own as an asset. Hosted ERP software application are purchased and installed on a remote server. Hosted ERP software is access through a VPN (Virtual Private Network) and remote desktop or terminal services. Mostly line of business applications are client and server based. Hosted ERP software applications must be installed on a workstation and client can access through work station link such as remote desktop, etc. The client/workstation installation is done on the hosted server. Hosted ERP software applications are not typically web enabled. Therefore to run application network infrastructure is needed such as terminal server. Cloud ERP software applications are web enabled and don’t need the client (workstation) installation. For cloud ERP software server installation in needed and a device with internet connection for the end user. No client installation is needed and no need to log into a program like remote desktop first. A lot of technologies and work goes into taking an application relying on a workstation to a true web based ERP software that only needs an internet browser to function. Many business owners are adding this functionality to their offering. Read Top 7 Cloud ERP Software Scariest Rumors at SolutionDots blog. Further word “Cloud” includes a wide range of applications and deployment software models namely SaaS (Software-as-a-Service). Cloud ERP (Enterprise Resource Planning) is a software that is present on a platform over the internet. After assembling numerous online resources and service providers we formed a general accepting definition of cloud computing. Cloud computing is a way to access software, hardware and other resources via internet in order to accomplish work and other business tasks. Cloud ERP (Enterprise Resource Planning) is an approach that use cloud computing platforms and services to provide a business with more flexible business process transformation. Cloud and hosted ERP profits its customers because it cut down hardware cost and offer applications scalability features. Also cloud gives you options of Public, Private or Hybrid. Public cloud is form of cloud computing in which a service provider provide resources. Such as applications, data storage and availability to the general public through the internet. Private cloud is a type of cloud computing that delivers similar advantages to public cloud, including scalability and self-service through proprietary architecture. A private cloud is dedicated to a single organization and complex to operate. You need experts who can understand cloud architecture and know how to upgrade, patch, secure and monitor. You can understand the difference between public cloud vs private cloud in a single image. When Companies need a cloud and hosted ERP? Read below describe possible situations that may be help you to adapt a new cloud and hosted ERP (Enterprise Resource Planning). As the company’s size grows with time similarly work load and complexity increase in the same manners. Companies during this phase face many challenges, i.e. dealings, cost control, distribution, production, sale and purchase. When the problem start arising in processes and management it indicates that company badly needs an advance cloud and hosted ERP. Companies that works for retailers or related to production internally and externally must need instruction for manufacturing processes. So companies who are facing difficulties must chose a cloud and hosted ERP software to manage their production planning processes. Develop new strategic plans to execute production processes efficiently and effectively. Try to figure out the flaws in the company that are becoming a factor of losing the money. A company can face loss of money due late updates of customer’s data, sales data information and gap of communication. Consider any flaw that is hurdle a big valid cause for risk management. To manage processes and automate reports and analysis for decision making shift to cloud and hosted ERP. Implementation of an ERP system is not an easy job. Always chose cloud and hosted ERP software for your company with open eyes according to your requirements. As per your business requirements you need to compare different options. Therefore, if your company doesn’t have a team of Information Technology (IT) who will analyze the best options for your company? The alternative solution is seeking a consulting service. Companies looking for Cloud and hosted ERP Solutions provider don’t need to worry about. For best cloud and hosted ERP software solution info feel free to contact at SolutionDots. Cloud and hosted ERP Systems of SolutionDots have gained popularity from past 5 years. There 100% customer satisfaction factor has given it unique identity in industry. Among many core features in their services, 24 hours technical support is most eye-catching one. SolutionDots Cloud and hosted ERP Solutions Systems, provides broader functionality with zero cost of extra upholding, technical staff. SolutionDots ERP is a wide-ranging cloud ERP solution urbanized exclusively for small & medium sized businesses and is delivered in the software as a service (SaaS) model. Our on-demand ERP leverages core functionality that has been in use and verified at hundreds of customer. With SolutionDots ERP you got access to everything in one integrated system to administer your business. You are granting everything you call for to handle your opportunities, orders, and operations in one integrated web-based ERP solution.